Better to go with the white one if you think you might upgrade to a Pro at some point though as it has higher trade in/resale value for some unknown reason. is this an additional controller to the one you get with the console? NVM I can see it is, wow amazing deal! I was wondering about a 2nd ps4 for the living room lol and I want horizon...extra controllers are worth while...DAMN...do I do it haha. Wonder how 'clean' the white controller and box will be in 6 or 12 months. I was reading yesterday an article where the Sony CEO stated that they have sold more PS4 Pro's than PS4 Slims. That sounded very suspicious to me as they appear to have throttled supply of the Pro in the UK - probably to keep the price high. I cant wait to play this game! Went for this offer before it was even posted on HKUD! 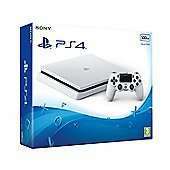 2 white controllers Still need to splash £40 on PS+ membership, then a bit more on a bigger hard drive. Got fed up waiting for a decent 1TB offer. I've had the first white console and controller that was bundled with Destiny for a few years now and they both look great. I've had the first white console and controller that was bundled with … I've had the first white console and controller that was bundled with Destiny for a few years now and they both look great.